If you have lost all your teeth, a few, or even just one, dental implants might be for you. Dental implants are made from incredibly strong materials that are created specifically to live in your mouth. 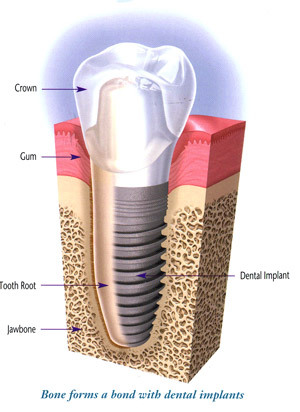 The implant is inserted so that it is rooted in your jawbone, and sits normally and comfortably. The procedure is similar to a tooth extraction (only in reverse!). Not all patients are suitable for implants—problems like ongoing diabetes or especially narrow or weak jawbones can make the procedure impossible. Make an appointment with your dentist to talk about implants, or your dentist will advise you at your next check-up whether implants would be right for you.